Let us love each other after now. Our emotions make our life full of color. Let us begin to work very hard to get back our rights. Let them study as they want. Let them choose their life partner. Let us love our family and our poor people. Let us be a good father, and take our daughter to school, when the sun is shining. It is beautiful to have your daughter’s hand in yours and walk with her. Let us become a nice tree to provide shade for those working under the sun. Let us laugh for each other and think we will die another day. Listen to them and learn from their experience. Let us become the best, even if we are a small bird. If you smile, then life will smile to you. If you find forgiveness, then life will forgive you. 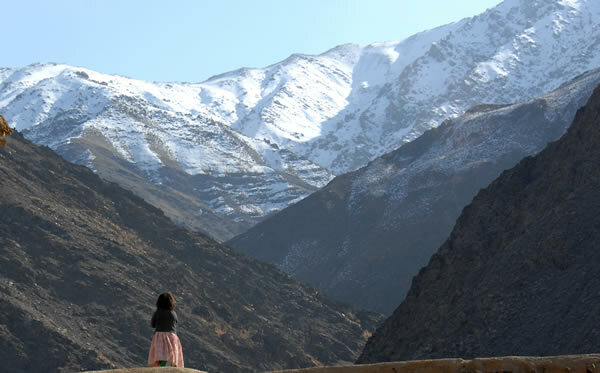 A girl looks South into the mountains surrounding Lower Kajakan Village in the Shinwari District of Afghanistan. Photo by David Elmore. This poem is one of the highlights of my day today. Full of wisdom and calm, it is amazing to see the scope of your forgiveness. Thank you. I am so happy and delighted to have found this website. What a wonderful antidote to all the hateful anti-afghan media hype. I always knew that the afghani people had so much more to share with the world. Thank you, Seeta, for your wonderful poem and the ray of hope and love. Be safe! This is the most uplifting thing I have read in a while. It takes incredible wisdom and courage to forgive. Thanks for reminding me that courage can be found even in a smile. This is a very touching and deep poem. You always hear of the war but never of the talent that the Afghan people poses in literature. This poem inspires me and others, to forgive one another, to keep positive and always smile. It incourages people to stay calm and just to forgive and really inspires me to stay positive. I really enjoyed this poem. It is very powerful in that you have such a positive outlook on life. It seems as if you want to make a change in Afghanistan and you plan on doing so through raising your children a different way from how you were raised. I think that there need to be more people like you who want to make a change and have a plan about how to make this change happen! I agree with your last line which says “If you smile, then life will smile to you. If you find forgiveness, then life will forgive you”. This is such a positive outlook on life and a lot of times, people forgot that if they are positive, the world will reward them with sending positive thing your way. This poem touched me in many ways. Thank you so much for writing it!